The widely-discussed 2018 midterms gave us an opportunity to put this method to work. We hypothesized that the more popular the search “early voting” was during midterms, the higher the chance that more democrats will turn out to vote than in previous elections . Therefore, they have a higher chance of taking control of either the House or the Senate. The above Google Trends graph shows that in non-presidential election years, there was a low volume of “early voting” searches. In these elections, there was a higher republican turnout, and won the House and Senate in 2010 and 2014 respectively. There was a record high turnout for the midterms this year and democrats were able to regain control of the House in sweeping numbers. This correlates with the theory that when voter turnout is low, republicans will either gain or maintain their current status, and when turnout is high, it’s in the democrat’s favor. Although it’s been almost two years, the 2016 US Presidential Election still has millions of Americans and people around the globe talking. While the polls always gave Donald Trump a chance at winning, he was generally regarded as the “loser” before the election. However, the outcome of swing states and their narrow margins of votes swayed the vote in Trump’s favor. A poll’s margin of error is generally used to account for any outliers in election outcomes. Polls only use a small sample of the population, so the end result of a poll will not match the exact results of the election, but should come close. While polls have been historically accurate when it comes to winners (there’s a reason why they are still widely used), there are situations where they may be inaccurate. President Nixon coined the term “silent majority” which may have been the case in the 2016 Presidential Election polling results. While there was no shortage of boisterous, self-described MAGAs, many Republicans did not wish to divulge they were voting for Donald Trump and elected to keep their vote private. The Bradley Effect combined with the so-called silent majority skewed polls in the Democrats’ favor. 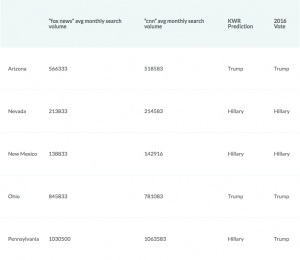 After the 2016 Presidential Election and the Alabama Special Senate Election between Republican Roy Moore and Democrat Doug Jones, Moz published a blog discussing how they used keyword research to accurately determine the outcome in both races. Their blog goes into much more detail, but essentially, author Britney Muller used Google Keyword Planner and evaluated state’s search volumes for the keywords “cnn” and “fox news.” In the end, her research correctly reflected the outcome of the 2016 election, which many polls failed to do. Her methods also correctly predicted the tight race between senate challengers Doug Jones and Roy Moore. Why is it that the polls were so wrong and search results had it right? When users are at home on their private computers, its possible they don’t feel the need to cave in to any societal pressures they may be feeling. This is where the real questions are asked and intentions are seen. Polling has proven to not be wholly inaccurate and they are an integral part of the election process. They guide how politicians run their campaigns and determine their focuses. But let’s take a look at a concept search engine marketers (SEOs) use to help determine what people are thinking when they search, the same concept that Moz used when determining the outcome of the 2016 election. Searcher intent is key when it comes to keyword research. Marketers use it consistently, but its advantages outside of the marketing world should be considered. With the discovery that keyword research may have a slight advantage over polling in regard to margins of errors, a “silent majority,” and The Bradley Effect, it would be wise for political campaigns’ marketing strategists to start using keyword research in order to predict their chances of winning and where they should be campaigning. In addition to that, political strategists could also associate certain keywords with their campaign, making their chances at success higher. What’s the best way to find these questions that users are asking? By incorporating keyword research and searcher intent practices. How do search engines work to give people the answers they want? Throughout Google’s history, they have continuously updated their algorithms to give better results to their users. Google uses a mixture of considerations when determining how websites rank on the SERP (search engine results page). Domain Authority, Page Authority, backlinks, valuable content, and bounce rates are all factors that decide where a page ranks. By using stats like bounce rate, Google can decide if a page answered the searcher’s question, and uses that information to optimize their methods. Even if people use different words, Google had become smart at understanding meaning, a process called Latent Semantic Indexing. For example, if you are searching for cars, Google understands if you are looking for “Cars” the Disney movie, a local mechanic, or looking to purchase a car based on other words in your phrase. This is a way for Google to more finely tune their user search intent. Google is essentially using context clues to discover user intent and show more accurate results on the SERP for each user. What questions are users asking and how do we find them? Currently, keyword research is a secret weapon amongst those who use it. Keyword research has evolved over the years and SEOs and PPCers alike have created optimized keyword research tools to help with these processes. Google Ads Keyword Planner, Moz, and Buzzsumo, among many others, have created ways for large companies, small-time bloggers, and anything in between to get a chance to rank on the SERP. These tools have allowed SEOs to understand what their targeted demographics are searching for and creating content that provides value for them. If marketers see a pattern in regard to a specific question that hasn’t been accurately or thoroughly answered, this is a way for them to provide content that brings value to their user. How can businesses, universities, politicians, and other institutions learn more about what consumers want from their products? By implementing practices that marketers already use, keyword research can start to shape anything from a politician’s campaign strategy to a high school teacher’s calculus curriculum. For example, you are hoping to invent a best-selling dog toy. In order to be successful, you need to know what people are searching for. Just by typing in “best dog toys” in Google, you are given some answers to your query. You also are provided with answers to similar questions other users have asked. 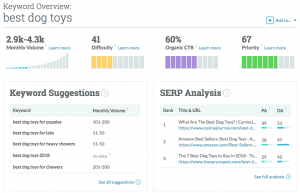 From there, you can use a tool like Moz, type in “best dog toys,” and find valuable insights. 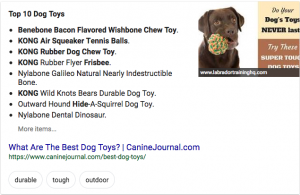 Now you know how many users search for “best dog toys” in a month, how hard it is to rank on the first page of Google, the sites that show on the first page, and other keyword suggestions, among others. You can now begin to formulate your idea based on what people are searching for. Let’s say you are an education administrator. What subjects do people search for in your region the most? Calculus? Algebra? English Literature? You might find some interesting ideas about curriculum design by comparing your district to a neighboring one. Or maybe you are an entrepreneur or business-person looking for exactly the right words your market cares about. Determining a UVP (Unique Value Proposition) is essential to a successful business or campaign. By accurately capturing user intent, no matter what field you are in, you will be able to find success that either your competitors can’t, or that will benefit searchers (as shown in the education administrator example). Creating a UVP with regard to searcher intent will set you apart from others in your field. You may be a homebuilder and there is public concern about energy savings. In your target area, you may research and find that “net-zero homes” are a popular search. Selling your homes based on this UVP may be able to bring value to your business that competitors have not touched upon. With less than two weeks until the 2018 US Midterm Elections, polls and their results seem more unreliable than ever to the public. Polling should not be dismissed, and countless research methods have been implemented to get accurate results. However, there is a margin of error that should not be ignored. By implementing SEO tactics that marketers have used for years to grow their products, the idea of keyword research can be used for politicians, schools, towns and cities, and beyond. The key to keyword research is finding the question users are asking and then answering it in a way that provides value.